Studies have shown that the incidence of cervical cancer is closely associated with human papillomavirus (HPV) infection, with HPV16 and HPV18 being the most common subtypes [1–3]. Currently routine non-invasive screening methods for cervical intraepithelial neoplasia (CIN) and cervical cancer are Thinprep cytology test (TCT) and HPV testing. However, both methods are limited by the high false positive and false negative rates and lack of association with patients’ prognoses . Therefore, exploring new non-invasive tests to assist the diagnosis of cervical lesions, especially the early detection of pro-malignant CIN, is important in improving the diagnosis and treatment of cervical cancer . In recent years, studies have found that the overexpression of human chromosome telomerase gene (hTERC) is a biological marker for cervical cancer . 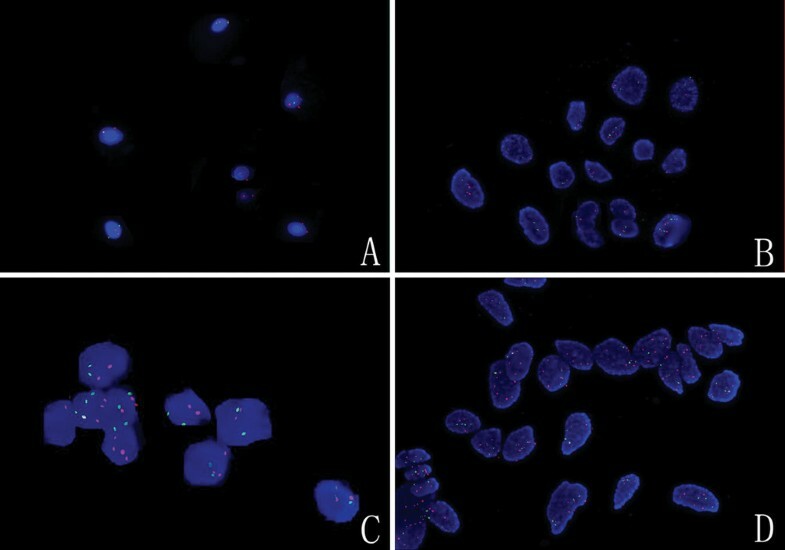 Fluorescence in situ hybridization (FISH) can be used to study the chromosome of cervical cells or examine intra-cellular genetic information within cells, and has been applied in the diagnosis of cervical cancer [7, 8]. Currently the main treatment for CIN is to retain the uterus, such as the loop electrical excision procedure (LEEP) , but the risk of canceration still exits after treatment, especially for patients with CIN II to III who were previously infected with HPV, and long-term follow-up is usually necessary [10–14]. In this study, FISH was used to detect hTERC amplification before surgery in cervical exfoliated cells of patients with CIN, and the results were compared with normal cervical epithelium and exfoliated cells of patients with cervical cancer. A retrospective analysis of patients with CIN who reached 24-month post-operative follow-up was also performed to assess the value of using hTERC amplification in the clinical diagnosis and prognosis of CIN. To the best of our knowledge, this is the first study on this interesting issue. Inclusion criteria: cervical cell specimens prior to treatment were collected from patients who visited the gynecology clinic at Jinan Military General Hospital from December 2007 to December 2009. All patients undertook cytological examination, colposcopy-directed cervical biopsy [15, 16], and received the LEEP or surgery. The study sample comprised exfoliated cervical cell specimens from 151 patients (average age 43.5 ± 8.5 years. Mean ± SD), including 81 cases of CIN (27 grade I, 54 grade II to III, average age 38.5 ± 2.7 years) and 45 cases of cervical squamous cell carcinoma (17 carcinoma in situ, 28 invasive carcinoma, average age 47.3 ± 13.5 years). There were also 25 cervical cell smears collected from patients who were followed for two years after treatment, including 11 patients with CIN III treated by the LEEP (average age 39.0 ± 4.5 years), and 14 patients with squamous cervical carcinoma who received radical hysterectomy (average age 48.5 ± 10.5 years). All patients provided informed consent to the use of their cervical cell specimens in this study. This research was also approved by the institutional review board prior to initiation. The control group included exfoliated cervical cell specimens from 40 women who were healthy and normal from routine gynecologic examination (negative for intraepithelial lesion or malignancy (NILM) from TCT, average age 41.7 ± 8.1 years). All cases were confirmed by pathological examination. For the collection of cervical cell specimens, a TCT specimen brush was inserted 2 to 3 cm into the cervical canal, and rotated 5 times around the axis of the canal. The cervical brush was kept in the TCT preservation solution. Slides were made using the TCT smearing slide machine, and Papanicolaou-stained. The remaining cells were stored at 4 K for hTERC amplification detection using FISH. The slides were processed twice (5 minutes each time) with a 2-fold dilution of sodium citrate buffer (SSC), with 0.1 mol/L hydrochloric acid solution for 10 minutes, with pepsin hydrochloric acid solution at 37 K for 8 minutes, 2-fold dilution of SSC twice more (5 minutes each), 70%, 85%, 100% gradient ethanol solution at room temperature for 3 minutes each, and then heated at 56 K for 3 minutes. Dual color site-specific chromosome /centromeric probes (hTERC/CSP3 DNA) were provided by GP Medical Technologies Inc. (Beijing, China). CSP3 was used as control probe. The hybridization of the hTERC DNA probe with the chromosome 3 3q 26.3 would show a red fluorescence signal and the hybridization of CSP3 DNA with the centromere of chromosome 3 (3p11.1-q11.1) would show a green fluorescence signal. For genetic variability and hybridization, 70% formamide/2 × SSC denaturation solution was pre-heated in warm water (73 K), and the probing mixture was then added for 5 minutes, followed by 70%, 85%, 100% ethanol gradient at −20 K. for 3 minutes each. Then 10 μL denatured probing mixture was added to the hybridization area of the slide, which was then covered and embedded in mounting medium, incubated at 42 K overnight. On the next day, the slides were placed in three bottles of formamide washing solution at 46 K for 10 minutes each. The coverslip was removed in the first bottle, and slides were washed in the second and third bottle. Then the slides were placed in 2 × SSC (B solution) at 46 K for 10 minutes, air dried in the dark, then read under a fluorescent microscope after staining. For the study group, a positive test was defined as the percentage of cells with more than two red signals higher than the positive threshold, indicating abnormal hTERC amplification. If the percentage was lower than the positive threshold, then the test was negative, indicating normal hTERC amplification. If the percentage was equal to the positive threshold, the result was reassessed after increasing the number of cells examined. The incidence rate of hTERC amplification was the percentage of positive hTERC amplification cases in each group. For statistical analysis, the row × column chi square test (R × C Χ 2 ) test (SPSS, Version 17) was used to compare the positive rates between groups and the Wilcoxon signed ranks test was used to compare continuous variables between groups. In the 40 control cases, TCT showed 3 cases of atypical squamous epithelium of undetermined significance (ASCUS), later shown on pathologic examination to be inflammation. There was no low-grade squamous intraepithelial lesion (LSIL), high-grade squamous intraepithelial lesion (HSIL) or squamous cell carcinoma of the cervix (SCC) (Table 1). Results presented as number (%). TCT, thinprep cytologic test; Number, number of cases; NILM, negative for intraepithelial lesion or malignancy; ASCUS, atypical squamous cells of undetermined significance; LSIL, low-grade squamous intraepithelial lesion; HSIL, high-grade squamous intraepithelial lesion; SCC, squamous cell carcinoma; CIN, cervical intraepithelial neoplasia; LEEP, loop electrical excision procedure. Among the normal cervical epithelial cells, there were two red and two green signals in nucleus during cell interphase. In the control group, on average 2.4% of specimens showed more than two red fluorescence signals (hTERC amplification) on the whole slide (SD 1.2%), and accordingly the positive threshold was set to 6.0%. The incidence rate of positive hTERC amplification in the control group was 0.0%. hTERC a mplification in heterogeneous cells demonstrated more than two red signals and no less than two green signals in the nucleus during cell interphase. For the 81 CIN cases, the hTERC amplification test showed that the percentage of cells with more than two red signals was 13.5% (SD 12.4%), the incidence of positive case was 71.6% (58/81), the sensitivity was 71.6% and the specificity was 100%. As summarized in Table 2, the percentage of hTERC amplification positive cells and the incidence of positive case were 9.2% (SD 4.6%) and 44.4% (12/27) for CIN I cases (the sensitivity was 44.4%), 16.0% (SD 14.4%), 85.1% (46/54) for CIN II to III cases (the sensitivity was 85.1%) 19.7% (SD 13.3%), 88.3% (15 /17) for carcinoma in situ cases, 47.0% (SD 25.2%) and 100% (28/28) for invasive carcinoma cases (the sensitivity was 100%) respectively. The specificity was 100% for all these subgroups (Figure 1). FISH, fluorescence in situ hybridization; hTERC, human telomerase mRNA component gene; Number, number of cases; CIN, cervical intraepithelial neoplasia; LEEP, loop electrical excision procedure. *P < 0.05 (compared with the control group). Photographs of hTERC amplification using FISH in the normal cervix, CIN I, CIN III and cervical carcinoma. (A) Normal cervix. Among the normal cervical epithelial cells, there were two red and two green signals in nuclei during cell interphase. (B) CIN I. The hTERC amplification in heterogeneous cells was demonstrated as more than two red signals and no less than two green signals in the nucleus during cell interphase. The hTERC amplification test showed that the percentage of cells with more than two red signals was on average 9.2%. (C) CIN III. The hTERC amplification test showed that the percentage of cells with more than two red signals was on average 16.0%. (D) Cervical cacinoma. The hTERC amplification test showed that the percentage of cells with more than two red signals was on average 47.0%. hTERC, human telomerase mRNA component gene; FISH, fluorescence in situ hybridization; CIN, cervical intraepithelial neoplasia. With the increase of pathological grade of the cervical lesion, the percentage of exfoliated cells with more than two red signals in the hTER C amplification test was also elevated in the study group (except the cases with 2-year post-treatment follow-up). The percentages of positive cell in patients with CIN, carcinoma in situ and invasive carcinoma were all statistically significantly higher than in the control group (Table 2). The rates of positive hTERC amplification among 4 types of abnormal cervical epithelial cells (ASCUS, LSIL, HSIL and SCC) were all significantly higher than among normal epithelial cells in the control group (P < 0.05). There was no significant difference in the rate of positive hTERC amplification between each type of abnormal cells within the study group (P > 0.05). The percentages of cells with positive hTERC amplification differed between various types of abnormal cells (P < 0.05), and tended to be higher from ASCUS to SCC (Table 3). TCT, thinprep cytologic test; FISH, fluorescence in situ hybridization; hTER C, human telomerase mRNA component gene; Number, number of cases; NILM, negative for intraepithelial lesion or malignancy; ASCUS, atypical squamous cells of undetermined significance; LSIL, low-grade squamous intraepithelial lesion; HSIL, high-grade squamous intraepithelial lesion; SCC, squamous cell carcinoma. *P < 0.05(compared to the control group). In the study group, out of 27 CIN-I cases confirmed by pathological examination, TCT detected 40.8% of LSIM (11/27). Also, TCT identified 48.2% (26/54) of HSIL in CIN II to III cases, 64.7% (11/17) of HSIL in cases with carcinoma in situ, and 100% (28/28) of SCC in cases with cervical carcinoma. In contrast, the positive rate of hTER C was 44.4% (12 /27) for CIN-I, 85.1% (46/54) for CIN II to III, 88.3% (15/17) for carcinoma in situ and 100% (28/28) for cervical invasive carcinoma. The Χ2 test showed that FISH had higher sensitivity than TCT in detecting all types of high-grade cervical intraepithelial lesions (P < 0.05), except cervical invasive carcinoma. For the 15 cases with 2-year post-treatment follow-up, the results of TCT were NILM and ASCUS, consistent with the negative findings of hTERC amplification. The comparison of hTERC amplification in exfoliated cervical or vaginal caecum cells at pre-operation and 2-year post-operation in 25 patients, including 11 cases of CIN III and 14 cases of cervical invasive carcinoma, with normal follow-up, showed that after LEEP or radical hysterectomy (using pathological diagnosis as the reference), both the percentage of hTERC amplification-positive cells and rate of positive cases decreased significantly (P < 0.05) (Table 4), indicating that LEEP and radical surgery were able to significantly reduce the number of cells with positive hTERC amplification. hTERC, human telomerase mRNA component gene; CIN, cervical intraepithelial neoplasia; LEEP, loop electrical excision procedure. *P < 0.05 (compared with pre-operation). HPV infection is a major risk factor for cervical cancer [1, 2, 4]. About 95% of patients with CIN carry HPV oncogenes, but only a few cases eventually develop invasive cervical cancer. Therefore, HPV infection is not the only factor for malignant transformation. Other factors may also contribute to the development of cervical cancer . Studies have found that during the transforming process from atypical anomalies to cancer, almost all cervical epithelial cells showed abnormal hTERC amplification [6, 8, 17, 18]. Human chromosome telomerase comprises telomerase mRNA (hTERC), telomerase reverse transcriptase (hTERT) and telomerase-binding protein (hTP1). The mutation of hTERC could lead to functional change of telomerase, which in turn causes chromosomal abnormalities [18, 19]. Therefore, the detection of hTERC amplification could be regarded as a marker of high grade lesion in future. After 1 to 3 years follow-up, patients with CIN I/II and positive hTERC amplification were more likely to progress to CIN III than those with negative hTERC amplification, indicating that specific gene mutation is the key for the development of CIN into invasive carcinoma . In fact, the fundamental differences between ASCUS, reversible mild CIN and progressive CIN are the genetic characteristics. From CIN II/III to cervical squamous cell carcinoma, the copy number of hTERC also steadily increased . This study showed that positive hTERC amplification is not only an important biological marker for cervical cancer [20–22], but also an important indicator of pre-malignant CIN. In the 40 control subjects, TCT showed 3 cases of ASCUS, which were later confirmed on pathologic examination to be inflammation, and there were no LSIL, HSIL or SCC cases. For the 81 CIN cases in the study group, the hTERC amplification test showed that 13.5% (SD 12.4%) of cells were positive (two red signals) , and the incidence rate of positive case was 71.6% (58/81). Of them, the percentage of positive cells and the incidence of positive cases were 9.2% (SD 4.6%) and 44.4% (12/27) for CIN I cases respectively, and 16.0% (SD 14.4%), 85.1% (46/54) for CIN II to III cases respectively. This suggested that the higher the pathological grade of cervical lesion, the higher the likelihood of being detected by hTERC amplification test in exfoliated cervical cells. In this study, the rate of positive hTERC amplification was 100% in patients with invasive cervical cancer. Patients with CIN, carcinoma in situ and invasive carcinoma also had a higher percentage of positive cells than control patients, and the differences were statistically significant (P < 0.05). In addition, the percentage of positive cells differed by pathological grade, and gradually increased with increase in pathological grade within the study group. Therefore, this method is important for CIN and cervical cancer screening, especially for identifying pre-malignant CIN. CIN with positive hTERC amplification, regardless of the pathological grade, should be given special attention in the clinical management.It should be noted that in this study the comparison of hTERC amplification results in the local exfoliated cells at pre-operation and 2-year post-operation showed that after LEEP or radical hysterectomy, both the percentage of positive cells and incidence of positive cases were significantly reduced, indicating that LEEP and radical surgery might be able to significantly reduce the number of cells with hTERC amplification. As for the issue of establishing positive criteria for hTERC amplification, previous research defined that if the percentage of cells with more than two red signals in nuclei during interphase reached 2.3%, the result was positive . This criterion improved the detection rate of CIN, although it cannot distinguish between LSIL and HSIL, and also increased the false positive rate. The detection of genomic amplification of hTERC using FISH is a non-invasive and effective approach for CIN. It is not only an important biological marker for cervical cancer, but also an important indicator of pre-malignant CIN. This study was conducted in a single hospital, limited by small number of cases and short duration of follow-up. Further research is warranted to investigate other relevant issues, for example whether positive hTERC amplification at 2-year follow-up after LEEP treatment among CIN patients indicates the recurrence of CIN or progression to cervical cancer. The study was funded by key funding from the Ministry of Health of China (WKJ2007-3-0001). The funding source had no role in the study design, the collection and interpretation of the data, writing of the report, or decision to submit the paper for publication.